Stock photo of Packed Ice in Conche Harbour, Conche, French Shore, Northern Peninsula, Great Northern Peninsula, Viking Trail, Newfoundland, Canada. Packed ice float in Conche Harbour, Conche, French Shore on the Northern Peninsula. 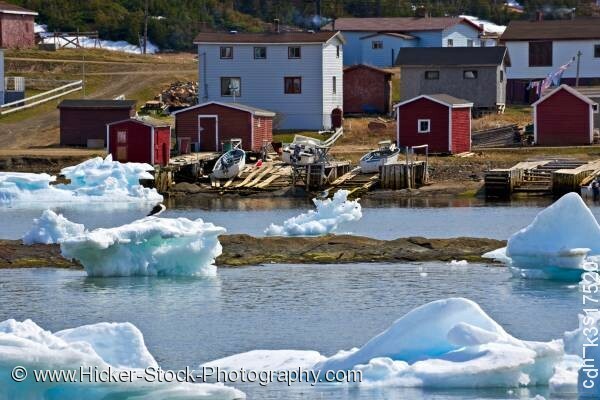 This stock photo shows several packed ice in Conche Harbour, Conche, French Shore, Northern Peninsula, Great Northern Peninsula, Viking Trail, Newfoundland, Canada. Large chunks of packed ice vary in size and shape as they float along in the waters of the Conche Harbor. The blue and white hues of the ice chunks reflect from the sunny day on the French Shore. A few small boats docked on the island’s shoreline with several simply built structures sit in the backdrop. The fishing houses along the shore are painted a deep red with white trim. Larger structures are painted in lighter colors with dark roofs sit just behind the small fishing houses. One of the buildings that sit near the dirt road has two stories. Packed Ice in Conche Harbour, Conche, French Shore, Northern Peninsula, Great Northern Peninsula, Viking Trail, Newfoundland, Canada.